Tigran Petrosian was World Chess Champion from 1963 to 1969. He is often known by the Russian version of his name, Tigran Vartanovich Petrosian. He was nicknamed Iron Tigran" due to his playing style because of his almost impenetrable defence, which emphasized safety above all else. He was a Candidate for the World Championship on eight occasions. He won the world championship in 1963 (against Botvinnik), successfully defended it in 1966 (against Spassky), and lost it in 1969 (to Spassky). Thus he was the defending World Champion or a World Champion candidate in ten consecutive three-year cycles. He won the Soviet Championship four times. He was arguably the hardest player to beat in the history of chess. 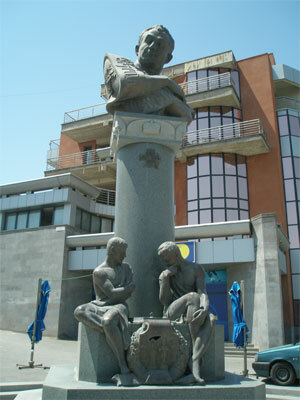 The monument to the great Armenian chess player Tigran Petrosyan was opened on July 7th, 2006 in the street named after Tigran Petrosyan in Davidashen district. In the solemn opening ceremony of the monument took part the president of Chess Federation of Armenia and today's president of Armenia Serzh Sarkisyan. The right to open the monument was given to the members of the young chess team who have brilliantly won 37th World chess Olympic Games in Turin.